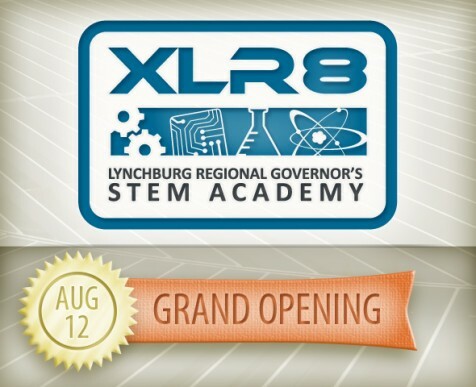 LYNCHBURG, Va. - July 18, 2013 - PRLog -- The grand opening and ribbon-cutting for the new XLR8: Lynchburg Regional Governor’s STEM Academy (http://www.xlr8academy.com/) will be held on Monday, August 12 from 10 – 11:30 a.m. on the campus of Central Virginia Community College (http://cvcc.vccs.edu/About/Maps/default.asp) (at 3506 Wards Road in Lynchburg), in front of the AREVA Technical Center (http://cvcc.vccs.edu/About/Maps/Maps.aspx?rmnu=6200&loca=WARDS%20ROAD). In case of rain, the event will be moved indoors to Merritt Hall. The public is invited, and attendees will also include regional leaders, with Governor McDonnell to speak. XLR8 STEM Academy is the 16th regional Governor’s STEM Academy in the Commonwealth of Virginia. XLR8 will launch this coming academic year on the campus of Central Virginia Community College in the AREVA Technology Center, which includes access to lab equipment and classroom space. XLR8 has been a joint effort by the Region 2000 Technology Council, Future Focus Foundation and Workforce Investment Board; Central Virginia Community College; the school divisions of Amherst, Appomattox, Bedford, Campbell and Lynchburg; and area business partners, including AMTI, AREVA, The Babcock and Wilcox Company, Centra, Delta Star and Wells Fargo. XLR8 dovetails with current regional K-12 STEM activities and workforce development initiatives. The goal of this institution will be to help close the gap between education and industry, furthering the economic vitality of this region. More information can be found at www.xlr8academy.com. This type of STEM Academy differs from the Regional Governor’s School for Science and Technology in the type of curriculum and courses offered. STEM Academy courses will have a career and technical education focus with the curriculum driven by the needs and projected growth of regional industry. Currently the two identified student pathways to be offered at the academy include biotechnology and mechatronics; the latter being the blending of mechanical and electrical engineering disciplines. The STEM Academy curriculum will offer students an opportunity to learn in an innovative, engaging classroom where students will develop critical thinking skills through hands-on, project based learning. STEM Academy students will receive dual enrollment credits for all courses; allowing them the option to work toward a college degree. Additionally, the STEM Academy will offer transfer possibilities through articulation agreements with local colleges and universities for students wishing to continue their education. STEM Academy students will also be able to earn industry certifications, allowing for job readiness upon program completion.